Keeping our pets safe is always the first priority. With dogs, this can be a bit of a challenge, especially when they get excited. When dogs that are more easily excited or alarmed by strangers, loud noises, cars, planes - anything, really - are left to their own devices, dangerous situations can occur, including biting, running into the street, and even getting lost. Keeping your dog safely restrained is an important service not just to you as its owner, but to your dog for its own safety. 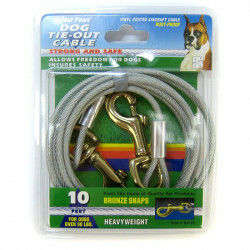 Heavy duty tie-out cables and stakes ensure that your zealous pooch won't go running off and get into any trouble. 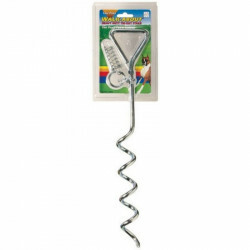 Pet Mountain's Dog Tie-Out Cable and Stake store features top quality products from the most trusted names in dog care and equipment, including Four Paws and Titan. Whether your dog is a huge beast or a little yipper, we've got the goods to keep him or her safely restrained. Four Paws Tie Out Cables ensure pet safety while allowing complete freedom. These vinyl coated aircraft cables are rust-proof and are available in a variety of lengths and strengths. 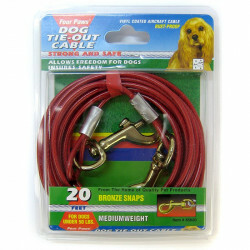 Four Paws Dog Tie Out Cables are strong and safe and include two bronze snaps. The Four Paws Giant Tie-Out Stake is 28 inches of solid, rust-resistant steel, forged with all the intensity needed to make sure your bulky beast doesn't go where he shouldn't, while still allowing him the freedom he desires. 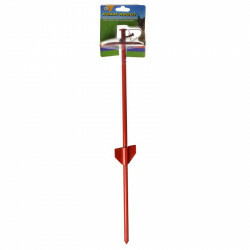 This solid steel stake is powder coated for weather resistance and easy to install. 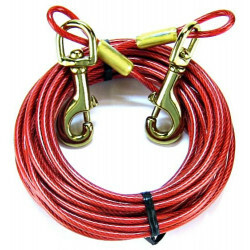 The Titan Tie Out Cable is made of galvanized steel aircraft cable and heavy duty, nickel plated, bull snaps. These tie outs are designed to safely secure extra large dogs.